How long is the tax code: It is far shorter than 70,000 pages. Is the Tax Code Really 70,000 Pages Long? In a perfect world, there would be no need to have an argument over how long a book is. You would think it should be a pretty objective inquiry. But not for the tax code, a book whose length has been hyper-inflated by journalists and others as a proxy for the complexity of our tax system. So how long is the tax code? I’m an attorney at Congress’ Joint Committee on Taxation, and I have the tax code sitting next to me as I write this. This particular version, published by Thomson Reuters, is a big book, but it is only one volume. American Public Media’s Marketplace Morning Report has reported that the tax code is 70,000 pages long. * The New York Times thinks so too. A Google search will find this number repeated again and again in the popular press. I have never seen a book that is 70,000 pages long, and I seriously doubt that such a book exists. So please be assured that the tax code is not 70,000 pages long. So where did this 70,000 page statistic come from? After a bit of research, I have narrowed it down to one source: Our good friends over at the Tax Foundation, a tax policy research organization, who cite the “pages in the CCH Standard Federal Tax Reporter.” That means nothing to 99 percent of readers, but I assure you that it is patently ridiculous. The CCH Standard Federal Tax Reporter is an enormous collection of resources compiled for tax lawyers and accountants. It is immensely useful, but it is not the tax code. True, it does contain the tax code, but it also contains legislative history, Treasury Regulations, editorial commentary, and collected court cases on each topic. 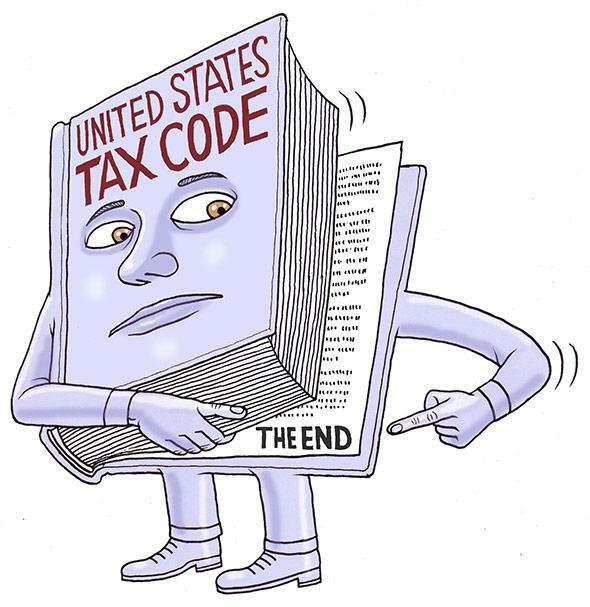 Calling it the tax code is like calling the Constitution the length of the collected Supreme Court cases on constitutional law—or like calling the alphabet the length of the dictionary. To give you an idea of how far afield the CCH Standard Federal Tax Reporter is from being the tax code, take this example: Tax code section 7402 is titled “Jurisdiction of District Courts.” This is a very short code section, and it has few associated Treasury Regulations. The CCH volume provides the text of the statute (that is, the text from the actual tax code), which takes up just half a page of text. After additional editorial material, it includes annotated court cases related to the jurisdictional issues—191 pages of them. But is it even useful to talk about a document’s length as a stand-in for its complexity? The Harry Potter series was quite long, but I’m pretty sure I caught most of the nuance (although admittedly I missed this). By comparison, Faulkner’s As I Lay Dying is quite compact, but to this day I have no idea what it’s about (was his mother really a fish?). And, not to put too fine a point on it, but the tax code has a table of contents, and doesn’t require you to start on Page 1. This may or may not be true for As I Lay Dying. I’m still not really sure.